Welcome to my biblioblog! I'm Carrie, a wife, mother, reader, thinker and dreamer. I love books (obviously) and love to share them with others. Thanks for stopping by! I am happy to consider reviewing books on behalf of publishers. However, please note that I will publish my honest thoughts of the book. If I do not like it, I will and do feel obligated to point out the reasons why I would not recommend it to others. I maintain an affiliate account with Amazon and receive compensation for purchases which originate via the Amazon link provided in any given review. I'm going to tell you right up front that this book is not well loved by critics and the modern media. It is no longer deemed politically correct. So why do I own a copy and why am I reviewing it? This book is a purportedly a retelling of a Chinese folk tale (which I have tried to find online and have failed). 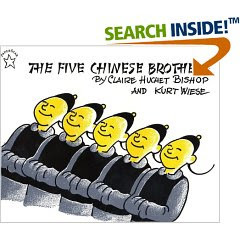 The Americanized story by Bishop and Wiese was published in 1938 and quickly became a "classic" of children's literature. However, in about 1977 it started taking the heat as racially stereotyping the Chinese. Complaints arose because all the characters "look alike" with "yellow skin and slanted eyes." In truth? I don't see it. I never have. Even now as I look at the illustrations I seem differences between the characters sketched in the community at large. but in a different setting. My mom read this book to me when I was young and I repeatedly checked it out from the library to read and reread it. I wasn't thinking about the culture so much as I was fixated on the super powers which make this tale intriguingly different than most. Personally, I think this is one of those unique tales that will inspire children's imaginations. It's cleverly told and, I think, illustrated in a complimentary way (as relating to the story and culture). It's not one of those "charming" stories that you cuddle up with your kids and linger over. Rather it's almost magical in some ways. I know the book has taken a lot of heat over the years. That didn't prevent it from being one of the very first books that I bought my son upon his birth. It was a story I wanted him to know because it was a story I personally had fond memories of. Ironically, it wasn't until I went to buy the book for my son that I discovered it had taken some flak in the literary community. It has been pulled from most school shelves but I really don't think it has good cause to be banned in such a manner. Also ironical is the book's inscribed dedication from Bishop to her parents: "To my father who made me love China and to my Mother a born story teller." If you research this book online you will find nay sayers. Such is the case with any book. More importantly, I think, you'll find people leaving comments in response to the critics relating how much they loved this book growing up and how excited they were to find a copy of it in their adult lives. Not for stereotypes but for the superpowers. It's a story that stays with you and isn't easy forget. For my part, that is exactly the sort of story I wish for my son to know. I think it's a great picture book, too. and not at all disrespectful of the Chinese or Chinese culture. But I tend not to see the politically incorrect problems that others see in various children's books. I just read a rant on how racist Prince Caspian (the movie and the book) is because all of the bad guys have dark skin and the black dwarfs are the worst. But isn't the White Witch the very worst villain in the Narnia stories? I remember this book, too. I think that my grandmother had a copy of it that we read when we were at her house. Oh, I read this book when I was a little girl and loved it! I didn't know that it had become controversial. I think there is wisdom in being careful and respectful when talking about people of other cultures, but our society has gone way, way too far in being "politically correct." I think if you are looking to be offended, you can be offended by almost anything. This was one of my favorites from childhood. I remember reading it again and again, and looking back today I fail to see what's offensive in it. (Frankly, I think some people are just looking for things to complain about). I agree with you, Carrie -- this one's a keeper. I'll say something that isn't "politically correct": White people wouldn't find this story offensive. If you see no harm, or feel no harm you are probably of the majority culture. The majority wouldn't see the White witch villain in the Narnia stories as reflecting the entire White race either. When you are in the minority, these stereotypes ARE harmful. The phrase "policitally incorrect" is just another way of saying: "don't make me feel guilty". Innocent young Black males are target of the police simply because people think "they all look the same", or "dark equals dangerous". Studies have shown that ppl do harbor these negative thoughts subconsciously because of media and historical stereotypes. Whether or not you see it as harmful doesn't change that fact. Actually, the book wasn't put on the banned list for being politically incorrect or racist, but because it depicted too much violence for the young readers it was written for. Execution is not exactly a typical topic for children's literature. I loved the book as a kid too, but looking at it now, I would not read it in my classroom. Not that I think it should not be on library shelves, but I would not choose to expose such young readers to the concept of burning people alive, drowning them, or chopping off their heads. Kayla - Thanks for your comment. Just to clarify - my statements re: reasons for banning it were made based on the arguments against it which I read online. I do'nt think it's because of the violence. But if that's the reason, I suppose that's why the Grimms have been Disney-fied.